Inet7's Outsourced Exchange 2003 hosting service will allow your organization to experience the full benefits of this powerful collaboration tool without all the cost and management worries normally associated with launching this application in-house. Use our Cost Savings Calculator to see how you'll benefit from Inet7's Exchange hosting service! Enjoy the full functionality of Exchange without the in-house maintaince and management headaches. Spam and Virus Filtering Included! Reduce your operating costs significantly. Use our Savings Calculator to find out how much you can save by using Inet7. Flexible, month-to-month contracts! Custom SLA’s catered to your specific needs. Always up-to-date. No upgrade hassles. 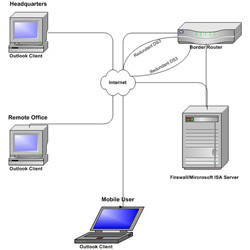 Various access methods, including Outlook Web Access. Enhanced E-mail: Exchange 2003 combined with Mircrosoft Outlook provides rich message screening. Enjoy the flexibility and power of Outlook Web Access 2003 that enables you to read your email or view your calendar from any Internet connection. Individual & Group Calendaring: Coworkers can easily check one another's availability for meetings, and schedule attendees and locations with a click of a mouse. Task Management: Exchange 2003 has built-in, powerful contact management, task tracking and notes features permit tasks to be assigned and delegated easily. File Sharing: Easily share and manage frequently used documents by placing them in shared areas of Exchange (public folders). Documents will be accessible by all team members and edited by authorized users only. Outsourcing your messaging needs to Inet7 allows you to take full advantage of the power and flexibility of Microsoft Exchange 2003 without the high setup costs, lengthy installation process, or maintenance hassles. Use our Savings Calculator to find out how much you can save by using Inet7.